A shaggy blonde camel, the boss male of the herd, roaming the Mongolian steppe. So I’ll be frank – never did I once imagine that I’d ever go to Mongolia. And never did I imagine it would be a beautiful, majestic country and one of the most memorable places I’ve been. Before I travelled there, my view of Mongolia was basically coloured by one, single experience. I knew a girl at uni through a friend, we had a few classes together and she was really nice. She was from Queensland. One day, our mutual friend told me that actually, the girl was originally from Mongolia – her parents sent her to live with an aunt when she was nine so she could go to school in Australia. She replied with one word – “Dusty.” – and changed the subject. So as you can see – I didn’t know much going in. But what I found was that Mongolia is so, so much more than that one-word description. It’s a vast, sweeping land of windblown steppe, rugged rock formations and towering, stark sand dunes. It’s a culture proud of the warriors and empires of the past, yet focussed on the traditional nomadic routes that bind it to the land. It’s a place of wild horses, camels, goats and sheep, eagles, vultures and deer. It’s a landscape that fills your soul with wide, empty spaces, achingly blue skies, and the peace that emanates from Buddhist monasteries and Tengri temples. A wild Przewalkski Horse, roaming free at Hustai National Park, Mongolia. We pulled into the train station in Ulaanbaatar not long after dawn. Nervously, my sister and I shouldered our bags and stepped onto the platform, looking around nervously. Ulaanbaatar has a reputation as the pick-pocket capital of the world, and we hadn’t managed to contact our tour operator in the last few days to confirm arrangements. Unsure where to go, and tired from the long journey, I tried to see the exit, when my sister Anita tapped me on the shoulder and pointed in the other direction. There stood a girl a year or two younger than us wearing a pink jumper and holding a sign with my first and middle names on it. There could be no doubt about it – that was our sign! Our guide’s name was Oji. She was 22, spoke perfect English despite never having travelled abroad, and she’d baked us a chocolate cake in case we hadn’t had a chance to have breakfast. It was delicious. She introduced us to Sanje, our driver, a good-humoured man in his mid-forties. Without speaking a word of English, he managed to tell jokes, join in games, and point out sights, and he and Oji treated each other like a cheeky niece and uncle, constantly teasing each other and laughing. Introductions done, we clambered into our four wheel drive van, and were off into the wilderness. Me in the van, ready to go! Our first destination was a local homestay with nomadic herders near the Elsen Tasarkhai sand dunes, the closest dunes to the capital and about a five hour drive. Along the way we stopped at the temple to the sky gods. Oji instructed us to find three small stones, then walk around the monument three times, throwing a stone onto the central pile with each lap. This was to bring us good fortune for the rest of the journey, and show respect for the gods. It was bitingly cold – this was early spring, mid April, and there was still plenty of snow around, and the wind whipped through our clothes. But the sky was a clear, perfect blue and the sun shone brightly despite the cold. It was very atmospheric. After another few hours drive, we eventually turned off the main (dirt) road onto something that couldn’t even really be called a track – how Sanje knew when to turn off, I don’t know. We bounced cross-country across the plain before finally pulling up at a little settlement in front of a huge, rugged pile of boulders. There were three ger (yurt) tents, a livestock shed, and a few vehicles, including a motorbike and another van. Goats and sheep milled around along with a couple of camels. Snow sat about six inches deep on the ground, revealing occasional patches of yellow grass poking through. There were about a dozen people around the settlement, and no one else as far as the eye could see. Or for a long way further, I bet. Oji introduced us to our hosts. I’m sorry to say I don’t remember their names, but they were a lovely family. The two grandparents were our primary hosts. Their adult children were also around to help with the animals, and the grandkids were running around gleefully underfoot, making up games and occasionally trying to help as much as a six year old can. There were also two English backpackers who had stayed the night before. They were stranded – their van was broken down, and they were waiting for a part from the capital. It eventually arrived mid-afternoon and they carried on top their next destination, but it was a reminder of how remote we were – yet we were comparatively so close to the capital, too. Mongolian gers are round, about 7 metres diameter, with short doors that you need to stoop through to enter, and peaked roofs that allow you to stand towards the middle. The frame is a wooden lattice with decoratively painted beams supporting the roof. It’s covered in layers of furs and other things to keep the warmth in, which is provided by a central wood stove. The inside of our ger was painted beautifully and the furniture was mostly carved wood. This was the family’s spring residence – they move seasonally, along with their livestock. And because it was spring, they were welcoming new additions on a daily basis. The pen at the livestock shed was crowded with over a hundred new born baby goats and lambs. They were utterly adorable, bleeting, trying to jump all over each other and running around on wobbly legs. Our hosts grandchildren jumped in the pen too, and were immediately mobbed by the newborns who all wanted attention. The adult goats were in the next pen being combed for their cashmere. Did you know that’s how it worked? I didn’t. They use long-toothed combs and brush away the winter coat at the goats moult during spring. It was an interesting process to see. The ger interior – I can’t believe how many people fit inside comfortably! Our hosts’ grandkids playing with the newborn lambs and kids – so cute! After lunch (Oji cooked), our host brought forth two saddled camels, grinning from ear to ear. “Ready for this?” I asked my sister. “I’m scared!” she replied, grinning in spite of herself. “You can do it,” Oji encouraged, as the camels knelt before us. Let me tell you – getting onto a camel is scarier than I expected! You clamber on between its two humps and get yourself settled, that part is fine. But it stands up back legs first, and you get pitched forwards, feeling like you’re going to tumble straight over it’s neck and onto the snow-covered ground! Desperately hugging the hump in front of you and clinging on as best you can, suddenly the front legs catch up to the back ones and you’re level again – but much higher up than you were before! Camels are really tall! 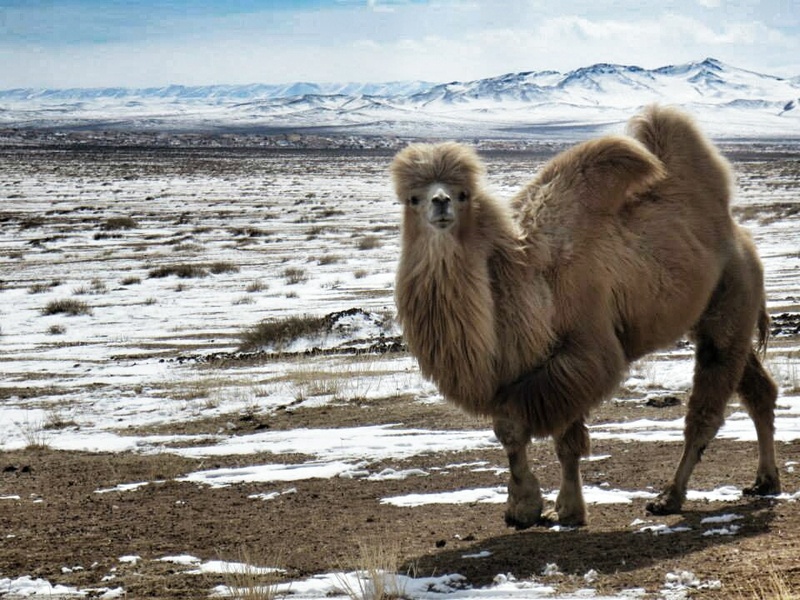 Camels in Mongolia are furry!! They have to be to deal with -40C winters. The rest of the camel herd – see the baby one? Too soon, we were back at the camp, and ready for the next part of our adventure – the sand dunes themselves. It was a short drive before the scrubby vegetation gave way to sweeping hills of sand, dotted by patches of snow. Anita, Oji and I clambered up and slid down dune after dune. It is really weird to be playing in sand and snow at the same time. To me, sand is synonymous with the beach, summer and warm weather. Snow seemed so out of place on top of the sand. It was bizarre, but a lot of fun. Returning to camp, we retreated into the ger for the night. The children decided to teach us how to play a game using goat or sheep knuckle bones – you had to toss them in a certain way, and they represented different animals depending on how they landed. Then we played a racing game with the knuckles. They were very cute kids, the sort who are happy to chatter at you even though you don’t speak their language. Dinner was traditional Mongolian buntz dumplings, made by Oji according to her mother’s recipe and with ‘help’ from us. They were really tasty – and clearly very authentic! We slept nine in the ger, yet somehow it didn’t really feel crowded. It was chilly though – I was glad for my coat. I’m not sure how they manage in winter! Me playing in sand and snow at the same time – it’s odd! Sliding down dunes is fun! A little girl with a baby goat! The next morning we admired the new lambs and kids who had arrived overnight – they were so cute! – before farewelling our hosts and travelling overland to Hustai National Park, home of the Przewalski Horses. I’ve written about this part before so I won’t repeat myself here, except to say that Przewalski Horses, the wild ancestors of modern horses, are absolutely wonderful, graceful, majestic creatures and the half hour we spent quietly walking alongside the herd through the Mongolian steppe was absolutely magical. After we left the park, Sanje pulled up in basically the middle of nowhere and Oji prepared our lunch on a portable gas stove she set up in the back of the van. Anita and I just admired the view. The sweeping hills around us just felt so vast. Mongolia feels somehow bigger than anywhere else I’ve been – I don’t really understand it, but that’s how it felt. The wind was icy and biting, but the sky was blue, the grass was golden, and lunch was hot, plain and delicious. The photo doesn’t really do the lanscape justice. Mongolia is vast, absolutely vast. The spot we stopped for lunch. Another few hours drive took us to Terelj National Park as the sun was getting lower on the horizon. We stopped to look at the Turtle Rock, named for it’s shape – according to local legend, there’s gold inside. The deciduous trees were all stripped bare of their leaves for winter and made an eerie forest amongst the rock formations – you could tell it would be a totally different place at the height of summer than it was at the start of spring when we visited. We met our second host family in a little snow-filled valley. The steep hills on either side meant the sun hadn’t gotten a chance to reduce the winter’s fall by much in this area yet, and rather than the little drifts of snow we’d experienced so far, this was proper deep snow, about 50cm worth everywhere we looked. Our second host family had a guest ger for Anita, Oji, Sanje and I, so we had more space, but it didn’t have the charm of staying in the same tiny space as the family back at the sand dunes. Oji cooked us a soup, and Sanje read my travel journal. Well, I say read, but he doesn’t know any English. Instead he flicked through it, looking at the ticket stubs and brochures I’d stuck in. It’s kind of wonderful, though, how much of a conversation you can have without a shared language. He would see a picture, say of the Hermitage from our stop in St Petersburg and say “Ah! Ermatahge!” and I’d say “Yeah! Hermitage!” and we’d smile at each other in the shared knowledge of the wonder of the Hermitage. After dinner, the four of us played Uno together, a game that easily transcends language barriers. The following morning, we visited the White Elephant Monastery, so named because the wings of the building against the hillside look like the ears of an elephant, while the stairs down the slope are its trunk. The place was remote and elegant, everything you might imagine when I say “Mongolian monastery”. We parked at the brightly painted gate and walked about a kilometre up the hill to get to the building. Along the way, we were greeted by the man who looks after the place while the monks are away for the winter (it’s just too cold here for silent meditation until summer). He was a tiny little man with a huge grin in a weather-worn face, and told possibly the worst jokes I’ve ever heard. He’d ask us a question, grinning, then gesture for Oji to translate for us. At first we didn’t understand what was going on – what this some sort of Buddhist riddle to reveal a profound truth or something? He’d ask questions like, “Where do you find a door?” which Oji would translate with a perplexed tone in her voice. He’d repeat it a few times, as we gave confused sorts of answers. “At a door shop?” I offered, to which he cried, “Yes! At the door shop! !” and laughed long and hard. Like I said, the jokes were terrible, but his enthusiasm for them was hilarious. The path up the hill to the monastery was lined with signs, each one with a number and a saying, a little bit of wisdom. Half way up, we stopped at the prayer wheel. Oji instructed each of us to spin it, and note which number the wheel landed on. That number was the saying that was relevant to us, kind of like a horoscope or even a fortune cookie. Mine was “Mind used to bad thoughts is hard to straighten, like a paper being rolled up.” I’m not sure what bad thoughts I had been having! But it sounds like good advice – focus on the positive, because it’s hard to pull yourself out of negativity. The building itself was graceful and interesting, brightly painted and with that special air of reverence that you only find in temples, churches, and other holy places. We rang the bells, and knelt before the alter, imagining the dozens of monks who would do those things in the summer time. The cliffs around were painted with huge murals – how anyone got up those near vertical cliffs to paint them is beyond me. The White Elephant Monastery – see the shape of the ears and trunk? Does it count as street art when it’s 100s of kms from the nearest street? At last it was time to head back to Ulaanbaatar. Along we way we stopped to peer into a shallow cave where a hundred monks had once hidden from the communist forces looking to execute them, a cold reminder of some of Mongolia’s painful recent history. We also stopped along a roadside where men had a few camels, a donkey, and three large tethered, unhappy-looking vultures. Not wanting to promote keeping wild animals tethered, Anita and I declined having our photo with the magnificent birds, but one of the men put the largest vulture on Oji’s arm anyway. They’re pretty cool creatures. Our train pulled out of Ulaanbaatar the next morning, and to our surprise we found ourselves sharing a compartment with the two English backpackers we’d met in the ger near the sand dunes a few days earlier. That’s something I do like about travel – you never know when you’ll run into someone again! Watching the sand arch over the horizon as we made our way towards China, I couldn’t help that my Australian-Mongolian friend had been so wrong about this country. It’s a stunning place, and one I really hope to return to one day. Perhaps in the summer next time though. I love this! It sounds like you had such a great experience, and those photos! I’m planning to go to Mongolia in mid-February (I know, brrr) and am getting so excited! Haha brrr indeed!! We were there in mid-April and, as you can see, there was still plenty of snow scattered around, though the weather was absolutely beautiful. But there’s something so exciting about experiencing these landscapes in winter. Ok, spring – real winter might be too much, but you get what I mean. The snow adds another dimension to like on the steppe and in the desert. Wear plenty of clothes, and be ok with the fact that it will probably be too cold to shower at all. It’s going to be brilliant!! How long are you going to be there for? And how far will you travel? Oh, wow. Mongolia looks like an amazing country. Love your pictures with the Mongolian gers. I hope to get to Mongolia in the future. Just been travelling with my husband around Australia for 11 months. We love the Outback and the wide open space. It looks like Mongolia has this wide open space too. Thanks for sharing your story. Yes it really is a stunner. And it’s funny that you mention Australia in comparison. My sister and I really felt like there were a lot of similarities between some of the Mongolian landscapes we experienced and our home in south-east NSW – something about the rolling grasslands and hills that stretch into a pale blue horizon. But I don’t know what it was – Mongolia just felt bigger, bigger than anywhere else I’ve been. It was almost like the horizon was somehow further away than usual.